Balustrades are legally required in the home. If you’ve got a drop of one metre or more, chances are you have a balustrade too. But just because you need them, doesn’t mean you shouldn’t want them too. Balustrades are a great canvas for a whole host of enthralling design ideas.And where better to place a bold design than the internal staircase of your home? They often draw traffic, and they’re normally visible from the living room; staircase balustrades are a designer’s magnet! To a lot of people, aluminium looks modern and sleek. But when you combine the aluminium and timber, you create something extra special. There is no end of bespoke options. That makes aluminium ideal as a vertical feature within your staircase balustrade design. Then there’s the timber; it’s a perfect material to run smoothly over the aluminium. The simple reason is this: timber feels more natural than most materials. A combination of timber and aluminium is both practical and stunning. That’s why it’s right up on our list of staircase balustrade designs. In terms of staircase balustrade designs, the floor to ceiling option is relatively new on the scene. Floor to ceiling balustrades offers better protection than any other. That’s, of course, because they extend from the stairs themselves, all the way to the ceiling. But that unrivalled protection isn’t all they offer. Floor to ceiling staircase balustrade designs also has an aesthetic quite unlike any other. We’ve already covered the undeniable appeal of the glass staircase balustrade design. But that’s not the end of the story! As with most designs, there’re a few things you can do to jazz it up with your own personal touch. One of our favourites is to add a frame. A smooth black frame surrounding a sleek glass balustrade is one example of mixing it up. Much like glasses, glass balustrades can adopt all manner of designs, and different ones suit different settings. Finally, let’s take some time to check out the newest staircase balustrade design: timber sleepers. This design is a simple, almost rustic one. But it is more versatile than you may think. All that’s required for this design is two wide timber planks and suitable support material. The two planks form the protective element of the balustrade and are supported by vertical steel or timber struts. With some expert help, you can stretch this simple design a long way. All you need is the right choice of timber, and quality installation. Of course, your choice of timber depends entirely on your preferences. But as a general rule, darker timbers suit more traditional home designs, while lighter timbers complement some of the more modern looks. Our advice is to look at a few different ranges and see what takes your fancy. 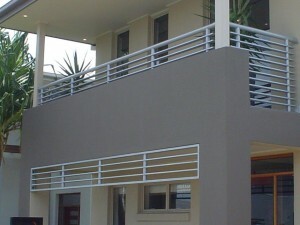 If you’re looking to add a balustrade to your home, get in touch with the experts at FenceCorp (07) 3715 5055. Posted in Advice, Balustrades, Updates. Bookmark this page. Looking for advice on all things fencing? Then you're in the right place. We're constantly staying up to date with trends and technologies and letting you, our customers, know. Chances are someone else has asked the same thing. We are always having people stop, admire, sometimes come back and ask us who did the fencing for us. We love that it is a unique and individual! From placing the order over the phone through to the picking up of our goods was easy, helpful and no hassle! Can you advise me of the fencing materials I’ll need and quote me a price?